This banana is known for its flavor, which is similar to vanilla ice cream. It also has a striking blue color with a matted tint, so it looks like it’s frozen. When it grows and begins to bear fruits, this banana gets yellow or green. In the world is known under various names such as Senzio, Hawaiian banana and Ice cream banana. Blue Java banana originates from Southeast Asia and is commonly found in the tropics of the earth. 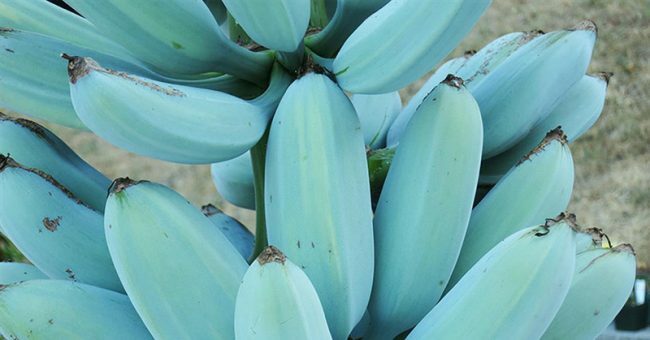 Also, the Blue Java banana can grow at temperatures up to -7C. Before planting the tree we should consider that it reaches a height of up to 6m. And it takes about 9 months until the first fruits appear. Also, you need to have good and quality gardening tips to fully and without any problems grow Blue Java. We know that bananas are specific plants, and therefore they require rich and humid soil. During the growth, the tree should be irrigated frequently and moderately, because excessive watering can cause rotting of the root. On the other hand, they require regular fertilization. A nutrient fertilizer such as NPK should be used in a ratio of 3: 1: 6 for the perfect care of your tree. For a one-foot plant, use 1 cup per month of fertilizer. And you also need to perform the fertilization when the weather is warm and sunny. Apply from the fertilizer all around the roots and plant and soak the soil. For further growth of the tree, one cup of fertilizer is needed at every two growth foots. We also need to know that persistent cloudy weather is unsuitable for germination of this tree. It is characterized by a wonderful flavor similar to vanilla ice cream, and can be consumed as a dessert. We know that all bananas contain a small amount of fat, or 0.3g. On the other hand, 89 calories are contained in an average banana (100g) and 22.8g carbohydrates. The Blue Java banana is rich with potassium, which helps us in the functioning of the muscles, the nervous system and the work of the heart.